With several resources available online and many apps that can be used in the country, travel to Russia has been made a lot less daunting. Russia’s capacity to inspire is matched only by its ability to infuriate. With its cultural treasures housed in institutions that do not always boast the friendliest of services, and its natural ones spread over nine time zones, Russia usually gives first-time visitors a challenging introduction. But with the emergence of online apps, communities and resources conceived by its tech-savvy new generation, getting to know Russia is becoming easier by the minute. Getting a Russian visa can be expensive and difficult. But if you are well prepared, you should get through the border without a hitch. Try Visit Russia for assistance. It is a comprehensive site that provides information and assistance while applying for travel documents. A few years ago travellers had to buy tickets and view train timetables at the station – a nerve-wracking prospect even for Russian-speakers. But the quality of life for foreign tourists in Russia has improved: now you can do it on the website of Russian Railways. Domestic and international flights can be purchased from a smartphone at Any Way, Any Day and from the AppStore or Google Play. The Any Way app offers 15% discounts on hotels booked using certain mobile phones. City guide apps are replacing guidebooks in helping tourists to plan day trips. The Calvert Journal City Guide App has recommendations for what to eat, drink and buy, and where to visit, stay and party, in a number of Russia’s major cities. The guides are compiled by local experts, but are available in English, with a focus on the creative sides of each town. They help users make cultural discoveries that were concealed from previous generations of travellers: besides insights into Moscow and St. Petersburg’s underground scenes,visitors to the Urals can find the address of a secret “speakeasy” cocktail bar in Perm that many of the city’s residents have never heard of, and guests to Kazan can be treated to a performance of Tatar fairy tales at the local puppet theatre. For help in finding your way from point A to point B in Russia there is 2-Gis, a street map app with over 250 Russian towns available on it. This app also shows the locations of such places as pharmacies and Internet cafes. Its reliance on a Wi-Fi connection means that it won’t help you find your way out of the Siberian Taiga, but if you find yourself lost on the outskirts of Yaroslavl it can take you to a cup of coffee, then a train back to Moscow. The last time I was in Moscow, while struggling to find my way in the metro I felt a bit envious of the homeless dogs on Sokolnicheskaya line. They got on the train at certain stations just like human passengers, and seemed to know exactly where to get off. For a smooth journey across an unknown city, the Yandex Metro App will plot a routethrough the metro systems of Moscow and St. Petersburg. The app works without an internet connection. Perhaps inspired by the homeless dogs, it will even tell you which train carriage you need to sit in to exit at the right end of the platform when you arrive at your station. Even with technology to help navigate Russia’s perplexing streets and transport systems, travelling there is daunting if you don’t speak the language. The translation app developed by the website Academic (can be downloaded for Android and iPhone here), does help somewhat in breaking down the language barrier. Academic will translate any Russian word or phrase if it can be copy-pasted into the app, and gives the Russian translation of any word of phrase in English (even if you can’t read the Cyrillic, you can show your smartphone’s screen to someone who can). You can use apps after returning from Russia to publish photos and travel tales, or to share tips with other travellers preparing for a similar journey. 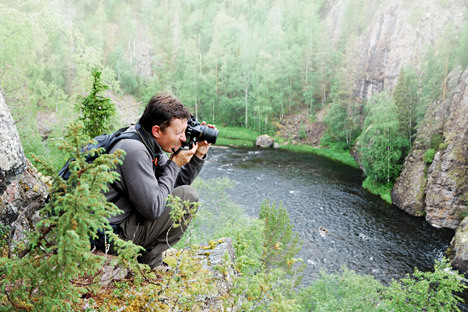 Global travel communities such as Triposo produce guides created by its users, where people who have recently visited Russia can upload their itinerary for others to follow. The fewer tourists visit a city, the fewer Triposo recommendations it has, so contributions from beyond Moscow and St. Petersburg are particularly in demand. Unsatisfied customers, which Russia has been known to produce from time to time, can now gain electronic revenge for disappointing meals and rude service by going on Gvidi. Designed as a platform to review cafes and restaurants, it is an opportunity to name and shame the establishments that left a bad taste in your mouth. The best photographs and memories from a journey to Russia can be kept together on another global community,TravelBlog. Travelblog – one of the world’s largest travel-writing audiences with nearly a quarter of a million users – supports the Cyrillic alphabet so blogs can be written in Russian. The site’s forums have a dedicated Russia section.